Is the need to market your device, pharmaceutical, or medical product running through your veins? Get in touch with a group of specialists who are focused on blood and its illnesses. 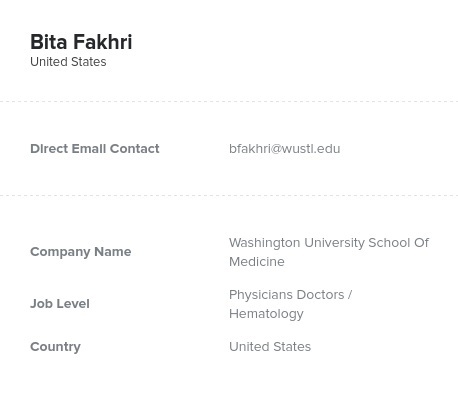 Pull our database of hematologists and start marketing today! Business-to-business connections are the lifeblood of any business. While conducting a medical marketing or pharmaceutical campaign, why not focus on the doctors and decision-makers who actually need and use your products? If you want to narrow your search to a targeted audience full of blood-focused specialists, pull this accurate database of hematologists now. Hematologists are doctors with the specialty of hematology, which is the study of the blood. Dealing with a variety of blood diseases from leukemia to hemophilia to anemia, these doctors have a complicated and ever-changing job to do. They often need to take blood and bone marrow samples, perform complicated diagnoses, and treat chronic illnesses. They need a variety of supplies, blood-clotting drugs, lab equipment, and other relevant products to do their jobs. Tell them about your product or service with this human-verified directory from Bookyourdata.com. It's full of the contact information of hematologists at numerous hospitals (from their emails to their titles to their phone numbers). Find a vast, spread-out array of doctors with the specialty of hematology, and then start marketing to and networking with them right away. Within minutes, you can download and use this mailing list. Buy our hematology physician database now!